A win for the devil worshippers. Update to this story. A Minnesota town abolished a “Free Speech Zone” to avoid letting a Satanist monument in a veterans park. 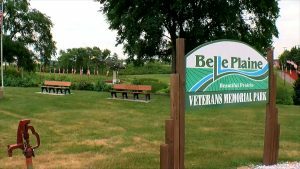 The Belle Plaine town initially allowed a Satanist monument featuring a pentagram in the veterans park following threats from a group advocating separation between church and state, as Heat Street reported earlier this month. The group threatened to sue the town for allowing a statue showing a soldier praying over a grave with a Christian cross. In response, the officials allowed all creeds to be featured in the park, including Satanism, and created a “Free Speech Zone” where such religious monuments could be put. The Satanist memorial would have been the first of this type of monument on public property in US history. Outraged residents, however, prompted the town to backpedal on its decision to allow the controversial monument. On Monday, the town council voted to abolish the “Free Speech Zone” where the Satanic monument was supposed to be placed and effectively blocked the memorial being allowed in the veterans park.